Preaching Sermon Outlines is a brief explanation of how to prepare sermon outlines that are easy to preach to your congregation. How do you put together preaching sermon outlines that are easy to deliver and engaging for your congregation? There are different ways to construct preaching sermon outlines. However, over the many years of preaching, I keep three feature in mind when I structure a preaching sermon outline. Before I share those three features with you, let me also say that there are three parts to a sermon: the introduction, the body of sermon and the conclusion. When I refer to the preaching sermon outline, I am referring to the body of the sermon. To put it another way, the body of the sermon is your preaching outline. Let's returns back to the three features I keep in mind when I am constructing preaching sermon outlines. They are: the main preaching point, the key word or hinge word and the subpoints and incidental points. Let's look at these three features individually. I usually develop the main preaching point from a topic or subject. This topic or subject is usually found in a passage of Scripture that I am studying at the time. For example, I recently preached a sermon from James 5:13-20 on the subject of prayer. Once I have a topic or subject, I look for an angle or perspective from which I can preach that subject or topic. After much thought, I developed the topic of prayer into the main preaching point of Christians Sharing Together in Prayer. Now that I have the main preaching point, I look for a key word or hinge word that will help me expand and explain the main preaching point. By the way, the key word or hinge word must be a plural noun. The key word or hinge word usually comes from asking the how, when, where, what or why question of the main preaching point. For example, is this passage in James telling me how Christians Share Together in Prayer or is it telling me why Christians Share Together in Prayer or is it telling me when Christians Share Together in Prayer and so forth? Of course, it is telling me how Christians Share Together in Prayer. I decided to use the word examples as the key word or hinge word. There are four examples of Christians Sharing Together in Prayer. When you deliver this sermon, you simply say: The first example of Christians sharing together in prayer involves... 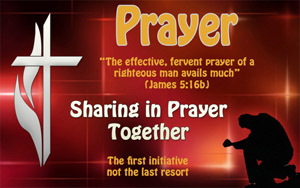 The second example of Christians sharing together in prayer involves... The third examples of Christian sharing together in prayer involves... and so forth. When you preach like this, there is a natural flow to your sermon because you are simply expanding and explaining your main preaching point. Once you have your key word or hinge word, you start to develop your sub-points. Your sub-points should expand or explain your main preaching point. For example, if you are looking at examples of Christians sharing together in prayer, then your sub-points should provide that information. In James 5:13-20, I saw four examples of Christians sharing together in prayer. They involve prayer in times suffering, prayer in times sickness, prayer in times of conflict and prayer in times of waywardness. Below is the preaching sermon outline of James 5:13-20. Once you have finalized your sermon outline, you will need to add content to your sermon outline. Of course, this will include illustrations. Illustrations are a very practical way to powerfully present your sub-points and incidental points. With all this finished, you simply need to add an introduction and a conclusion. The introduction introduces your main preaching point and your conclusion summarizes what you said about your main preaching point. As I said before, there are many ways to construct preaching sermon outlines, but I find this way helpful to me.